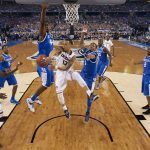 The 2016 Men’s NCAA National Championship might go down as one of the greatest March Madness finales since the basketball tournament was first played in 1939. With eight seconds left to play, UNC senior guard Marcus Paige made what seemed like an impossible game-tying three-pointer that was well-defended by Villanova. But with 4.7 seconds remaining on the clock, the Wildcats still had plenty of time. The ball was inbounded to senior guard Ryan Arcidiacono who took the ball down court before dishing to junior forward Kris Jenkins. Jenkins is one of those players who believes every shot he takes is going in. On Monday night, he was right. The ball left his hands with 0.4 seconds on the clock and swished. The Villanova Wildcats are the National Champions of college basketball. Villanova’s student body is about a third of Chapel Hill’s, and on paper the basketball team from the Philadelphia area also didn’t stack up when it came to size. Analysts and bookmakers in Nevada predicted that UNC’s height advantage and interior play might be simply too much for the smaller but speedy Wildcats to overcome. Nova covered both the spread and total last night. The two-point underdogs won by three, and UNC and Villanova scored a combined 151 points, two more than the 149 line. It marks the third straight year the NCAA title game underdog has won against the spread. Over the last 10 years, the favorites and underdogs are now perfectly split by taking five games apiece. Before Villanova started their season in November, books had the Wildcats around +2500 to win March Madness. If you were fortunate enough to trust Villanova with a $100 bet during the fall, today you’re $2,500 richer. Though Villanova basketball has long been a power player on the national collegiate level, the university hadn’t been to a NCAA championship game since its first title back in 1985. In his 15th year as head coach, Jay Wright has faced criticism throughout his tenure and questions of whether he possessed what it takes to lead a team all the way. His program won the Big East regular season in both the 2013-2014 and 2014-2015 seasons, but each time failed to make it through the third round of March Madness. After a dismal loss to Seton Hall in the 2016 Big East Championship, Villanova ended up as a two seed for the NCAA tournament, which made their road to Houston that much harder. They overcame #1 Kansas in the Elite Eight and then manhandled #2 Oklahoma in the Final Four. 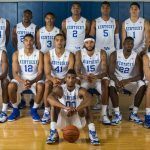 Now they can say without question they are the best team in the country, and Wright finally has vindication against his naysayers. “You’re like a parent when you’re a coach. I just couldn’t be prouder, couldn’t be happier to see them enjoy this and fulfill their dreams,” Wright stated.